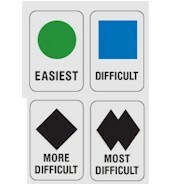 The chart below only works for people of average height and arm length. To make sure you ski pole length is correct, turn your ski pole UPSIDE DOWN and grab your pole under the basket or on the grip side of the basket. Your lower arm should be parallel to the floor. Pole length can vary for people the same height because of different arm lengths. Novice to intermediate skiers - If you are between sizes, go longer. A longer pole will help keep your body in better balance and allow you to put your weight on the proper ski easier. Advanced skiers, expert skiers and racers - If between sizes, you may go shorter. This is due to the aggressive stance which is normally lower than intermediates. When in doubt, always go longer. Many poles can be cut down in length by removing the grip and cutting the shaft. Poles can not be made longer. Extend one arm out to your side making it parallel to the floor. Check your ski pole length by putting your pole UNDER your arm pit. Your pole should fit under your arm comfortably. Less aggressive skiers - If you are between sizes, go shorter. More aggressive skiers - If you are between sizes, go up a size. More aggressive skiers usually raise their arms higher. A longer pole can help. Less aggressive skiers sometimes don't raise their arms as high. When in doubt, go longer. Poles can be cut down in length by removing the grip and cutting the shaft. Poles can not be made longer. 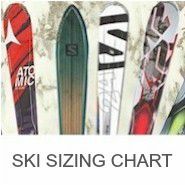 Find the correct Ski size! 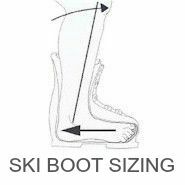 Find the correct Ski Boot size!